The airfield today was more suited to waterpolo than gliding. In the absence of a glider with floats the decision was reluctantly taken to suspend flying for today.. There was a well attended lecture on the symptoms of the approaching stall which was appreciated by all but particularly our newest member who is very keen to give his fixed price to solo scheme a good workout. The airfield was very wet after some heavy rain over the last few days. With more heavy showers threatened in the forecast the decision was relucantly taken not to fly. The attending pilots took the opportunity to have a lively discussion on wave flying which was followed by a lecture on winch launching. After lunch the secretary and chairman went on a hunt in the fields adjacent to the runway and recovered several wayward launch strops. hopped about on the K13. rain midday stopped us flying for a while. hope to see him again when his rounds bring him our way. not a bad weekend really. off line for long. Thanks again everyone for making the day possible. Today began with the overnight snow still laying on the airfield. The orographic cloud was at ground level. CFI Don Puttock confidently announced that this would lift by 12.30pm, which it did! Science, witchcraft or a lucky guess. The jury is still out. The morning was filled with a very interesting lecture on meteorology. Perhaps it was science after all . The afternoon was busy with plenty of training flights in what proved to be ideal conditions. A good turnout and the return of one of our winter migrants (Andrew Beaumont) combined to inspire us to haul the kit out onto a sodden airfield, in the process exercising some creativity in establishing a safe and minimally soggy area on which to operate. But the mud won in the end, meaning that even the combined enthusiasm and muscle of our Chairman and Secretary failed to move the winch from its boggy parking place into position. 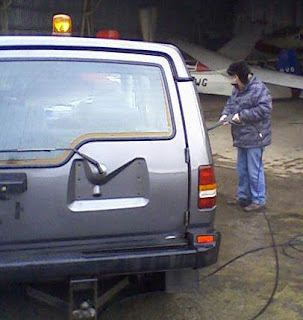 Then the rain started, so we put everything away again - but not before an intensive pressure washer session transformed the appearance of both 'Discos' and quad bike. There followed a useful brainstorming session in the club-house, where Steve Lewis and Bob Jones explained some of the thinking behind the open day on Easter Monday. Some useful thoughts were provided by the whole team, both in connection with the open day itself, and the development of our 'trial lessons' programme on a broader scale. A quiet start, with winds slightly east of North, during the day the winds backed and we were forced to change ends. It turned out to be a perfect training day. Alec had an intensive days training and has now mastered the winch launch. Trevor rigged just in time to plant himself in the thermals and fly an out and return to Okehampton----not far, but it is February after all. Some of us adjourned to the Castle at Lydford for a convivial pint before meandering home. With the wind at 10 knots from the northeast and bands of cloud sitting across the wind, the excitment around the club was almost physical. So, did the day deliver a classic wave flying day? Not exactly. There was an almost random mix of ridge, thermal and wave lift which provided plently of entertainment for the pilots and trainees alike, most of whom managed soaring flights. 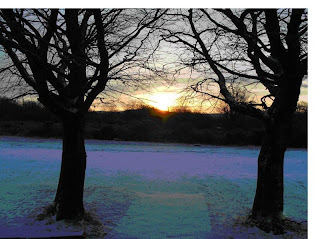 The soaring conditions switched off around 4pm and, as everyone had had their need to fly satisfied, the toys were put away and an early retreat to the clubhouse for tea and biscuits was made. In return for their great hospitality,the Bere Alston Scouts were subjected to a Met talk. As part of their meterology badge they are required to record the daily weather over a 2 week period. They choose, pressure, wind, rainfall etc. They were shown how to create a cloud in a bottle and recognise different types of cloud. 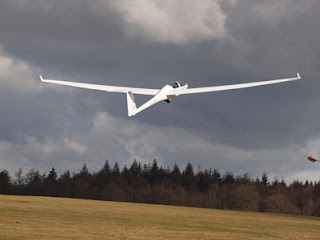 The Scout producing the best work will be treated to a flight in a glider, this I will judge in a few weeks time. 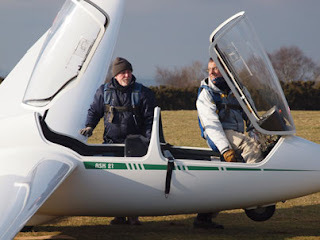 This course was organised at the Devon and Somerset Gliding club ( North Hill ) to prepare potential Assistant Category Instructors for their courses later in the year. Attending were Martin Cropper, Dave Jesty, Ged Neveski from Brentor and Lisa Humpries, Andrew Muggleston and Matt Wright from Horth Hill . Mark Courtney , Simon Leeson , John Burrows (JB) and Don Puttock were the coaches. 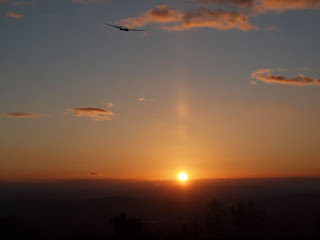 The scene was set for a very intensive week of gliding instruction in freezing cold winds mostly from the East or North East. The candidates learned to instruct various flying excercises while either flying or controlling the flight. Anyone who thinks that this is easy is welcome to give it a try. Did everone gain from the week? Oh yes! Did everyone enjoy the experience? After defrosting, the candidates had to admit that they had. Many thanks to Noth Hill and their members for the help in running the course and the use of their equipment and airfield. Spurred on by the promise of sunshine and hints of possible wave, a small but enthusiastic group braved the cold weather. Following a prompt start, 24 launches were achieved before the cold really kicked in and the remaining few of us decided to call it a day. With some of the team away at North Hill undergoing instructor training and at least three others basking in sunnier climes, everyone got plenty of flying, and it was gratifying to see people honing their skills and toying with the small amount of lift that became available. Full marks to Heather for starting to get stuck in to her flying training for real - and enjoying the experience. However, the biggest grin of the day was displayed by Gus who made a dramatic arrival with a trailer load of materials for some building renovation. We seem to be "light" on training pilots on recent Wednesdays so, if you are eager to learn or are an experienced pilot out of currency, come along and join us next week. cloud using a bonfire. Sadly that didnt work. lifted above 200ft or so. of talks on met, Fohn effect and Soaring Techniques. Thanks Trevor for some very interesting "expert" tips. Good early start today with all the gliders out and inspected ready to go. First flight was delayed while the low cloud burned off but this waiting time was well used with some runway repairs and a good lecture by Ged and David on winch launching. Good start to your instructor training chaps. The intrepid Sandra flew solo again today and, in fact, posted the longest flight of the day until Ged claimed he had flown one minute longer. Did he "amend" the log sheet or was that just a rumour? Flying finished a little early due to the glider canopies misting up as the evening temperature dropped. Many thanks to Deputy CFI Mark for helping to make the most of the day. The good news is that the temperature has risen 8 degrees. The bad news is that it has brought with it very low cloud and drizzle in the SW wind, so no flying today. Judging by the amount of hot air eminating from the clubhouse, if we had been flying, a thermal source would have been guaranteed. The view while eating a burnt toasted Bacon Sarnie. Ice on the inside of the windows, and the coffee and bacon sandwich seems so much nicer. The weather was unremarkable except for the occasional snow storm! Two new trainees joined us, a warm welcome to Alan Carter and Alec Birch, great to have you with us. Both of these guys have flown before, Alan went solo with the RAFGSA, and Alec, a friend of Roger and Barry Green is a hang glider pilot. Congratulations to Sandra Buttery, first solo today. She seems to do her best flying when no one is in the back! Roger and Barry Green both completed their Bronze certificate today. How often has a father and son team achieved that on the same day!! A big thank you to Alan and Heather who kept the cables coming all day---the day would not have been such a success without you.